Hunting dogs are more than just a living, breathing hunting partner. These dogs are also often a beloved family pet or canine companion. Taking great care of your hunting dogs should be a given. Here are four key care tips to keep your hunting dogs happy and healthy. It’s easy to forget about routine veterinary care like checkups and vaccinations, particularly if your veterinarian does not send reminders. Still, staying current on your pup’s routine care can keep your hunting dog healthy and allow him or her to enjoy a full life. Regular veterinary appointments also provide an opportunity to catch potentially serious health problems early while treatment can still make a big difference. Hunting dogs are susceptible to weather-related conditions like hypothermia in the same way as humans. Dogs that get in the water during a hunt can be particularly at risk on a cold or windy day, for example. Monitor your dogs for signs of distress and be prepared to keep them warm or move to a more sheltered location as necessary. A neoprene vest can help to keep hunting dogs safe from hypothermia during winter, says James Dickson, writing for The News-Star, as can occasional breaks from hunting in a vehicle or warming shelter. It is common to find various types of poison around hunting camps, cabins and barns, especially when they are used to keep rodents or other wildlife away from your shelter. Many poisons can taste good to an animal and an unsuspecting dog may eat it. Take a few minutes to look around for any poisons or other dangers before turning hunting dogs loose at a new location. Hunting dogs are often tasked with boldly going into rough terrain where they may encounter a variety of threats. Venomous snakes, bears, coyotes and alligators are but a few of the possible threats that a hunting dog may encounter in the field in different parts of the country. Be aware of what predators or threats are common in the areas where you hunt and be alert for any dangerous situations for the dogs. KT British Labradors has been proudly breeding British Labradors since 1995. 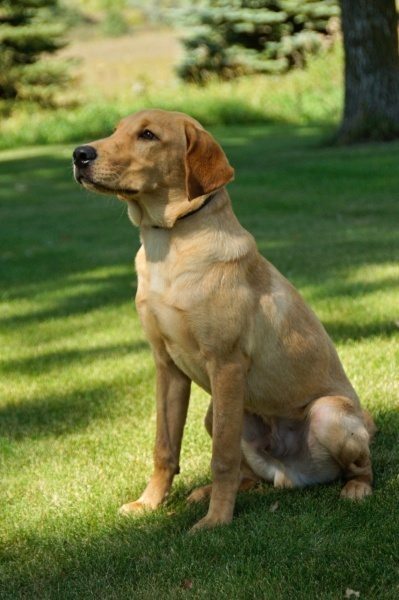 These dogs are smart and loyal, making them the perfect hunting dogs or family pets. Contact us by phone at 218-685-5103 to learn more about our dogs or dog training services or check on the availability of puppies online now.